1832 was a pivotal year in Chopin's life. It was the time he relocated to Paris as a political refugee from Poland and the time he began a painstaking process of establishing himself as a teacher, pianist, and composer in the French capital. This Mazurka in B flat major dates to that year, but was not published until 1909, more than half a century after Chopin's death. Like many of his posthumously published works predating 1828, this piece must not have fully satisfied the composer. 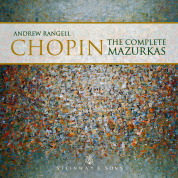 But it is a charming, if short work (slightly over a minute), and fully deserving to stand with the nearly 60 other mazurkas in Chopin's output. This piece features a hearty, chipper theme that brims with festivity, merriment, and Polish spirit. Those who observed that Chopin was never more Polish than when he lived in Paris could cite this, one of the first works he produced there, as evidence of his nationalist character. The theme is heard twice and then followed by an equally joyous second subject. After the jaunty theme returns, another secondary idea -- subdued but colorfully lively -- is played, after which the work closes with a final statement of the infectious main theme.